To turn it on again, press the (VSA® OFF) button until you hear a beep. 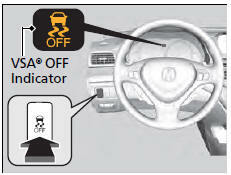 If the low tire pressure/TPMS indicator comes on or blinks, the VSA® system comes on automatically. In this case, you cannot turn the system off by pressing the button.